Choosing a favorite music artist, for me, is a difficult challenge. One minute country music will be blasting out my speakers and the next day I will be addicted to the sounds of Frank Sinatra. Some bands, such as Third Eye Blind, Matchbox Twenty, and OneRepublic will always be a part of my favorites list. I have to say that if there is a time here I just need some good background music to increase the mood of the environment, Coldplay is my go-to choice. 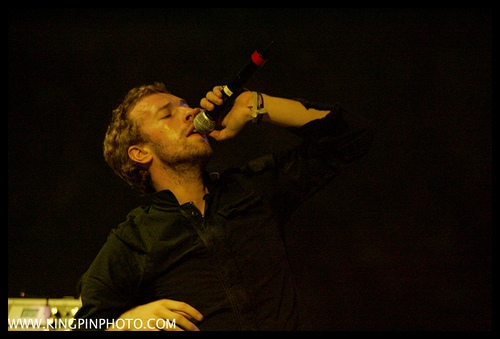 I really enjoy Coldplay’s use of rhythm piano, mixed acoustic and electric instrumentation, and melodic song writing. In addition, they are willing to take chances by infusing sounds from various different cultures. 1.) As a thank you to their fans, Coldplay released a free copy of their album LeftRightLeftRightLeft, which features 9 live songs including “Viva La Vida” and “Clocks.” The album can be downloaded on their website. 2.) The official Coldplay website includes a page called The Exhibition Room where fans have the opportunity to display their digital artwork. Throughout its existence fans have uploaded their animation, graphic design, home videos, claymation, illustrations, paintings, photography, music videos, and short films. Each week, Coldplay members choose a new piece of work to add to the online art gallery. 3.) Another page on the official website is called the Oracle. This area allows fans to ask “The Oracle” questions regarding band members such as “What is Chris Martin’s favorite song he has performed?” and much more! 4.) One interesting use of public relations is the adventures of Coldplay puppets. Each puppet looks like one of the band members and a picture is taken with the puppets in an area that best represents each tour spot. Although I am not really sure what significance this has, it sure is humorous and interesting to see where the puppets will end up next! Here’s a picture of the puppets in Argentina!